It is with a profoundly heavy heart we have to announce one of our Rowboat Toby Wallace rowers is missing at sea. In the early hours of Monday 15th February 4 of the 8 person crew were rowing (at location close to: 18 29’ N 039 06’ W) in moderately heavy seas when a wave swept across part of the rowing deck. Michael Johnson (21) from Zimbabwe was swept off his seat and into the sea. The force of the wave caused his safety line – attaching him to the boat – to break. The force of the waves and wind conditions at the time caused Mike and the boat to move apart. The crew tried their utmost to stop the Toby Wallace and row back up into the conditions, but this proved impossible. They triggered their EPIRB (Emergency Position Information Reporting Beacon) and contacted UK HM Coastguard by Satellite Phone. The crew also deployed their life raft as a sea anchor, to slow their progress, in the hope that Michael would drift to their position. Working with Portuguese coastguard coordination, UK HM coastguard requested any shipping in the area to aid a search for Michael. A cargo ship changed course to the location and two aircraft were deployed to help with the search. By the time any search assets arrived in the area it was daylight (first aircraft reported on location at 12:00 GMT). The area was searched throughout day until fading light forced an end to operations with no sign of Michael. At last light the remaining 7 crew of the Toby Wallace were transferred to the search ship and will be transferred to land when the ship next makes port. Both UK and Portuguese Coastguard have declared a termination of search operations, but Michael’s family are desperate for the search to continue and appeal to anyone who can help. Last night, it was with great relief that we were able to announce the Fire Ant crew had safely transferred from the rowing boat to a cargo vessel. Gemma (Fire Ant captain) called on the satellite phone today with more detail of the rescue operation. Gemma has asked that we pass on a heart felt thanks to the UK Coastguard and the Captain and crew of the two ships that came to their aid. Note: we are withholding the name of the ships until we have the owners permission to publish. Late on Friday – just as it was getting dark – Fire Ant suffered a capsize. The crew were unhurt, but knew the boat had taken some damage. It was not until first light on Saturday that they could assess the damage. Inspection showed they had broken another oar. Even with the oar they had repaired the previous day, this left them with only three. It was also discovered their GPS chart plotter had been torn from its mount, the water maker compartment had flooded and the AIS (automatic identification system) that allows them to detect ships in their area had stopped working. Given the accumulated impact (less propulsion, limited navigation, no AIS, limited ability to make water) of the damage, the crew, in consultation with shore support and HM Coastguard decided to initiate a rescue – just after 09:00 UK time. HM Coastguard asked the crew to trigger their EPIRB (Emergency Position Indicating Radio Beacon). The coastguard then issued a MAYDAY relay broadcast message to all ships in the area asking for assistance. Several vessels responded and the nearest two were asked to proceed to the location of Fire Ant. The first of 2 large ships arrived at some time late in the evening and started rescue operations. The plan was to stop the cargo vessel up wind of the rowing boat, allowing Fire Ant to row into the wind shadow of the large ship. This proved difficult due to Fire Ants now limited number of oars. In the meantime the second vessel arrived on station and stood off in case extra help was needed. The first ship tried several times to get in an appropriate position. On the seventh attempt the ships crew were able to throw a line from their bow to Fire Ant. They then guided the rowing boat along the ship to the pilot boarding ladder. The Fire Ant crew then climbing the ladder to safety. Gemma reported the ships crew have really looked after them. The have a cabin each, a proper bed with clean sheets and they have each taken their first shower in more than two weeks. The ship is now bound for Canada and should arrive on the 22nd or 23rd of this month. This should give Gemma enough time to fly back to England before heading on to Barbados to see her husband Simon Chalk and the crew of the Toby Wallace arrive. An unexpected but welcome opportunity. And talking about the Toby Wallace, we still have one rowing boat out there. Simon and the crew are very relieved to here the Fire Ant team are safe. They have also had quite and eventful few days. 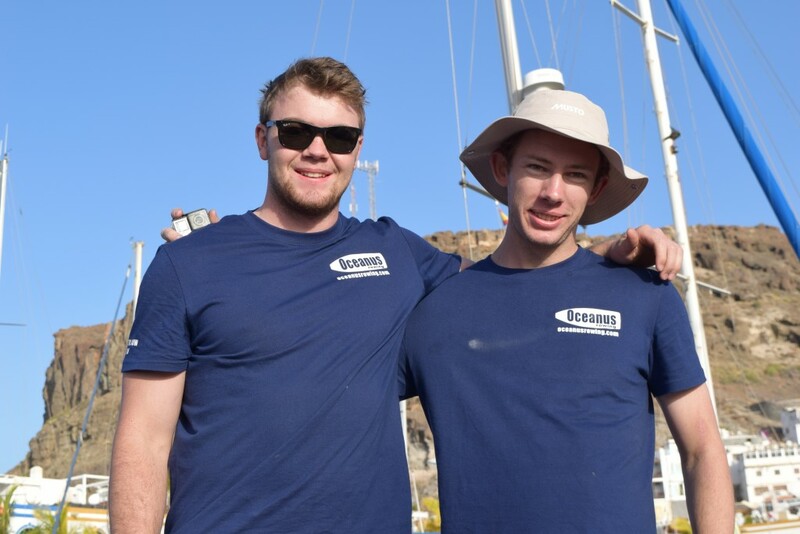 They have managed their fasted 24 hours to date, with an impressive 92 nautical miles towards Barbados. The were visited by a large Whale for over an hour on Friday and had a brief encounter with a Shark today. Simon reports the Toby Wallace has slowed slightly today. The crew were pleased to reach half way, but a little disappointed to find they are currently 3 hours behind record pace. This is still quite impressive given they were stopped for 12 hours when they repaired their rudder. If they can complete the second half at a similar speed with no stops they should be ahead of the record again. Today has been a very busy day on shore with Skype video interviews for BBC, SKY and BFBS and numerous talks with Radio, News papers and online media. We are very pleased to see the Fire Ant just giving page http://uk.virginmoneygiving.com/team/femaleatlanticrow2016 is still receiver donations. Following damage to Fire Ant caused during a capsize incident yesterday and after discussions with shore support and UK coastguard, the girls have decided it is unwise to continue with their attempt to row across the Atlantic Ocean. At approximately 23:30 GMT, the girls transferred to a large ship. More details to follow tomorrow. Today it was the turn of the Toby Wallace crew for a spot of ocean surfing. Simon reports the boat lifting up and surfing ahead of a wave at an incredible 17.8 knots (20MPH or 33KPH). With yesterdays rudder repair, they were still able to achieve 60 nautical miles in 24 hours. Surfing and a good average pace should see them well into the eighties in this period. Hopefully this is the start of them winning back a few miles on the record. The Fire Ant Ladies took some time out to repair their broken oar and are pleased with early testing. Being further east, they are experiencing some choppy conditions. Their 45 miles is a good achievement in the circumstances. The sea should start to become more consistent for them soon. Today we would like to mention a charity Richard is supporting. Thames Valley Air Ambulance. http://www.tvairambulance.org.uk The most rapid emergency medical response in the Thames valley area. They are a charity that only exist due to the generosity of their donors. To answer a question asked by 11 year old Archie Westwood. 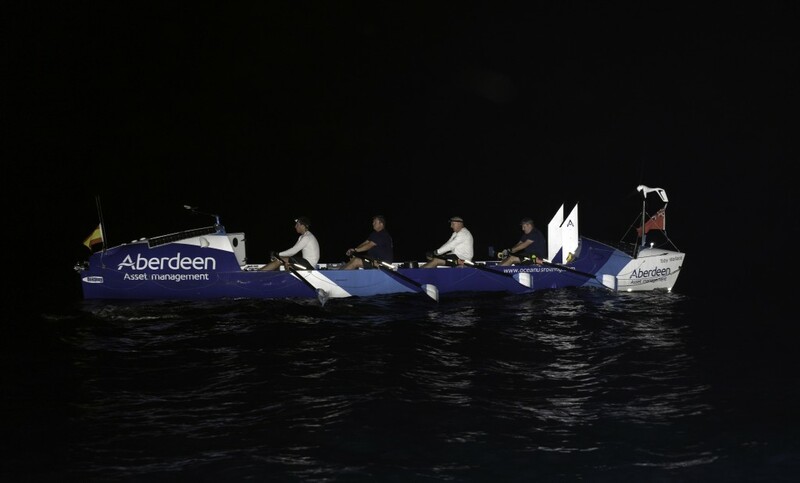 The longest the crew row for in one go is 4 hours – on a night watch. The other watch can get almost 4 hours sleep then. In all they each row for 12 out of every 24 hours. 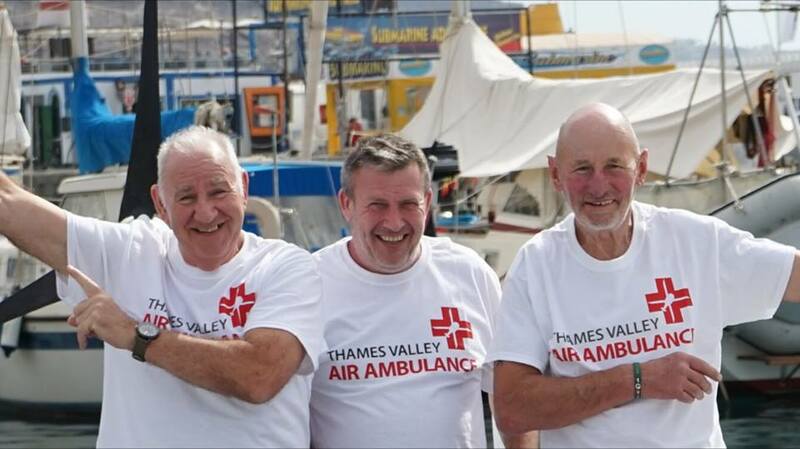 Pictured below, Roger, Richard and Graham, modelling TVAA t-shirts – Richard is the young one in the middle! They may look like they are doing a (very english) Haka, but in fact it is a rather understated Usain Bolt. It is an almost inevitable fact that when small boats are exposed to big oceans things can break. Both our crews carry spares and tools to help make repairs. Today the spares and tools on both boats are getting used. In the early hours of this morning Toby Wallace’ rudder post (connecting rudder and steering quadrant) sheered in half. They put a drogue out for a few hours whilst they made repairs and waited for the glue to set. In the early morning light, Murray put on the safety harness, tied on a line and jumped in with the repaired rudder. With Simon leaning out of the aft hatch they were able to refit the rudder and are now underway and making good speed again. 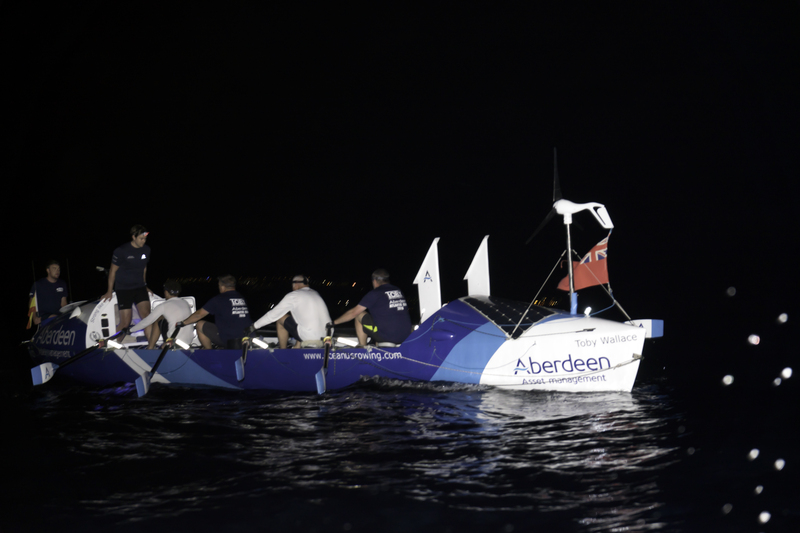 The Toby Wallace travelled another 80 miles towards barbados in the 24 hours to midnight. Their current average pace puts them slightly outside of record, but the second half of the row is typically faster than the first. So we expect them to make up some time. Meanwhile the Fire Ant crew managed a creditable 53 nautical miles in the 24 hours to 10 AM. They report having a dark night of very confused seas. This is due to distant weather systems to the north and south pushing some waves into their area, while the locally generated waves are moving west. The westerly moving waves should become dominant over the next 36 hours and improve conditions for the girls. Not to be outdone by the Toby Wallace, Fire Ant broke an oar later this afternoon. They will make repairs to maintain their usable oar complement. Both crews are still in good spirits, looking forward to better weather ahead and a comfy bed in Barbados. Fire Ant have picked up their pace again. They reported confused seas overnight. Combined with the dark sky due to the new moon and cloud cover, the rowers were finding it hard to steer to their course. However, it is clear from the tracking that they did manage to maintain a good course and have travelled another 52 miles closer to Barbados. The girls have increased their speed even more through the afternoon and flattened their course towards Barbados slightly. This should hopefully result in a very good ‘distance made good’ in the current 24 hours. Jane on Fire Ant has asked to pass a message to 32 Squadron to thank them for their support and to tell Neza(?) “they have not run out of food yet!”. The Toby Wallace also reported having a challenging night. For them the issue was struggling to maintain speed to keep the record within reach. In ocean rowing record attempts it is usually true – the lower the distance achieved (per day), the more effort it has taken to achieve it. The slower days are usually when the sea conditions are doing nothing to help and indeed often hinder progress. Rowing in these condition is much harder. Despite the overnight challenges, the crew are doing well and like Fire Ant they have increased speed during the afternoon. The Toby Wallace is still slightly ahead of its best position at this stage in previous record attempts. At midnight tonight, they will have exactly 20 days to get to Barbados for the record. The weather over the coming week should help them increase speed and have every chance of a record breaking row. Pictured below, Murray Fabre and Mike Johnson – the main engines on the Toby Wallace. Both crews were entertained throughout much of last night by lightening storms. These storms were some way from the boats and the night remained dry. Toby Wallace continue their impressively straight track. Simon intends to continue this track for a few more days. Their night row was livened up a little by the their first Flying Fish landing on deck. This will give the crew the opportunity to play a game that is probably unique to ocean rowers – Flying Fish Roulette! The rowers will divide the deck area between them. When a flying fish lands on that area, the rower wins a suitable refreshment at the finish! If the fish hits them and then lands in their area, the refreshment count is doubled. Simon was keen to hear Saturdays football score today. As an avid Leicester supporter he was very pleased with the result. The Six Nations rugby results were also pleasing to most of the crew. Both crews broke one oar gate overnight and have replaced them from spares. The Fire Ant crew saw a slight increase in their 24 hour distance made good. We hope this trend continues as they change to a slightly more westerly route and the weather fills in behind them. Jane was spending some time on her off watch continuing to test possible solutions to their automatic steering problem. Gemma is looking forward to sitting on a seat that does not move and drinking tea. They report temperatures are beginning to rise, though it is still a little chilly at night. Both crews continue to enjoy your messages. Ewan on TW would like to pass a personal thanks to Grid for their message. The weather continues to look good for impressive trans-ocean times. With the weather staying fine both crews have enjoyed another 24 hours of good progress. Toby Wallace passed Fire Ant during the night and then today they also moved further west than our friends in the French 6-person crew on Audeamus (follow their progress at: http://www.rameocean2016.com ) . The speed of the Toby Wallace has increased this afternoon, so we expect the current 24 hour period to result in a greater distance travelled than the passed few days. Simon (Captain of Toby Wallace) reports all on board are well. Nobody is suffering from any significant sores, they have looked after themselves well, helped by reasonably dry conditions. Ewan is enjoying rowing in the stroke position and the Zimbabwe boys continue to supply a significant amount of power. Fire Ant continues on their more southerly track and have just moved to the south of the Toby Wallace. Though they are still more than 100 miles north of the French crew. Gemma (Captain of Fire Ant) says everyone is in good health. Apparently Liv has followed the example of many previous ocean rowers and is now rowing naked! Thanks to Geoffrey Baker for some great pictures of The Toby Wallace setting out. More to following when I have resized them to fit this website. Both crews have now passed the significant milestone of 500 miles rowed. Toby Wallace is now further west than the Fire Ant, having passed them during the day. Fire Ant are now on a more southerly track, running with the wind. They continue to have some issues with their automatic steering, but they have found they can quite effectively trim steer. This means they can manually set the rudder at a specific angle and leave it set for a long period of time to control their direction of travel. Their current more southerly route should hopefully keep them in favourable conditions for the foreseeable future. Toby Wallace have had another day of going slightly slower than they would like, but remain in good spirits. over the passed two days, it seems both boats were heading for the same piece of sea. But during the day the crew of Toby Wallace snuck passed the girls. It is likely Fire Ant will cross the track of the Toby Wallace crew later tonight. Both teams report they are all well and are now acclimatised to life at sea. The each enjoyed knowing the first 500 miles is done. They should both reach the next big milestone, 2000 miles to go shortly. Next it is 1000 done and then half way! Oceanus Rowing shared a post. Day 96. The weather is good, the ocean calmed down, the wind is westerly at 20 knots. Hopefully, mother nature will give the boat and I a break. As always in good conditions, you need to conduct an inspection of all compartments, check everything, sort things through. In the Southern Ocean, good weather is a luxury, and you need to use every moment of it to prepare yourself and the boat for the next round of bad weather.